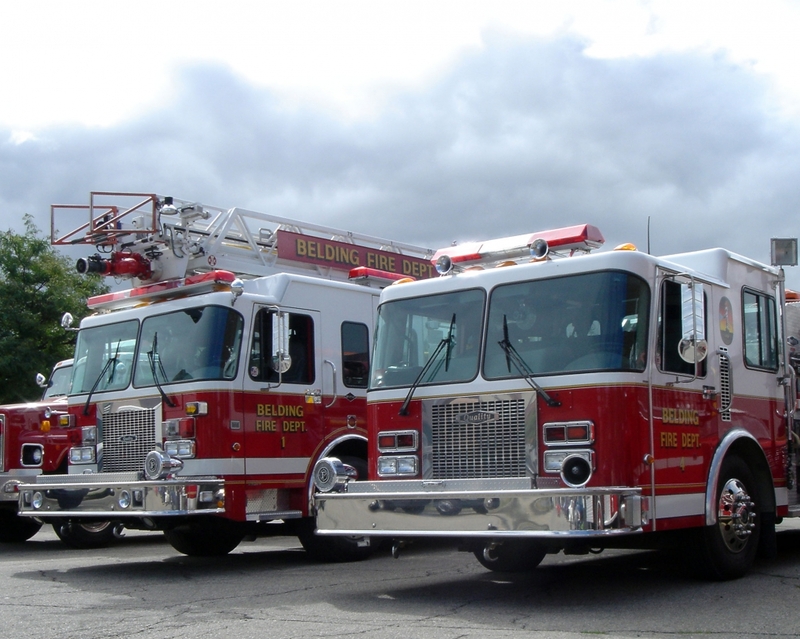 The Belding Fire Department provides 24-hour service. Full time firefighters each work a 24-hour shift at the fire station. On-call firefighters may respond from their place of employment or from their home. Response times within the City limits for the first fire apparatus average less than three minutes. 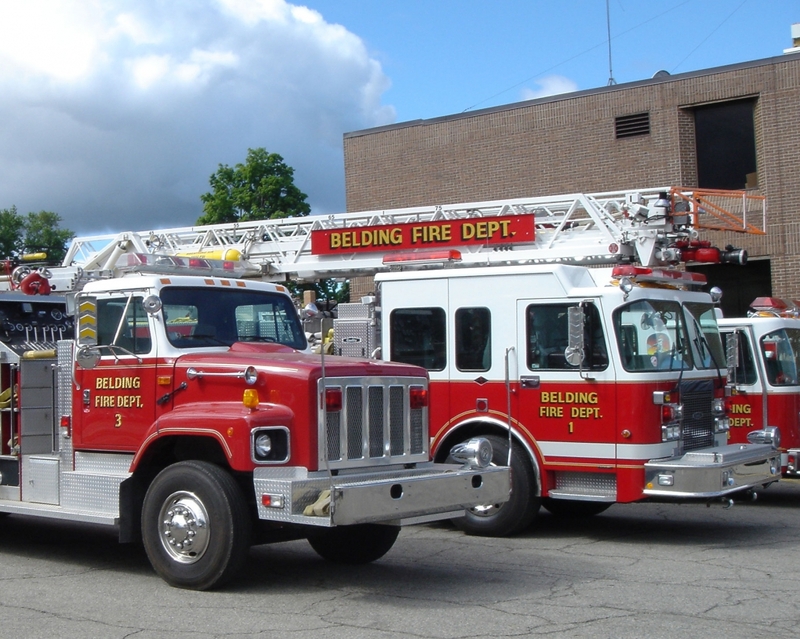 The Belding Fire Department is responsible for fire and rescue services in the City of Belding, Otisco Township, and the northern portion of Keene Township. The City of Belding was re-evaluated by the Insurance Services Organization in July, 2006. On March 1, 2007, the ISO PPC rating for the City of Belding was Class 4. The Belding Fire Department provides Medical First Responder services to our protection area. The on-duty firefighters respond in addition to an ambulance on all pre-determined high priority medical emergencies. The mission of the Belding Fire Department is to provide the highest quality emergency and non-emergency services to protect the safety and property of people throughout our community from the effects of man-made and natural hazards through the dedicated efforts of our well-trained and equipped team of firefighters and support personnel. The City's weather warning sirens will be tested on the 1st Saturday of every month at 1:00 P.M. starting in April and continuing throughout the severe weather season. The National Weather Service will issue a tornado watch when conditions are right for the formation of a tornado. This is the time to begin preparations. The weather siren will be sounded when a tornado warning has been issued for our area. A tornado warning means a tornado has been sited and that persons should immediately take cover. The Belding Fire Department will respond to carbon monoxide detector activations. Most fire deaths occur at home. Most occur in homes without a working smoke detector. Working smoke detectors save lives. Please check smoke detectors regularly and change the batteries at least twice yearly. City of Belding ordinance requires working smoke detectors in all existing residential occupancies. Residential occupancies include all one and two-family dwellings and apartment houses. Installation information may be obtained by contacting the Fire Department. The Belding Fire Department has two squads and 20 firefighters, many with more than 10 years of service. The City of Belding takes pride in its professional, well-equipped Fire Department. Where is the Fire Department? The Fire Department is located behind Belding City Hall at 120 S. Pleasant Street. What number should I dial in a fire emergency? How should house numbers be posted? City of Belding ordinance requires visible house numbers at or near the front entrance of all residences and businesses within the city limits. Visible street numbers are critical to emergency service personnel when trying to locate the origin of an emergency call. What about a fire escape plan? Develop a plan with your family about what to do in case of a fire and practice it. Plan two ways out of every room. Have a prearranged meeting place outside for everyone to gather. Once you are out, stay out! Call the fire department from outside of the house or from neighbors. How to obtain a bonfire permit? City ordinance requires residents who wish to have recreational bonfires to first obtain a permit from the Fire Department. Please contact the Fire Department at 794-1900 ext. 212 to schedule a bonfire pit inspection. Brush fires or the burning of yard wastes is prohibited within the city. How to obtain a DNR Brush Fire Permit? Open burning in the Township is regulated by State of Michigan rules. A Department of Natural Resources Burning Permit must be obtained from the Fire Department by anyone who is going to burn brush, grass or leaves. The burning of construction materials or tires is strictly prohibited. For further information call 794-1900 ext 212. Emergency vehicle size has increased greatly over the years, due to the growing types of emergency responses made by fire departments. Residences, which are located any distance from the main road, may have driveways that are too narrow or have low height restrictions due to overhanging tree limbs. Restrictive driveways may prevent fire or other emergency vehicles from reaching an emergency scene. Fire prevention programs and tours. The City of Belding Fire Department will provide fire prevention programs or fire station tours to groups of any age. Call to set an appointment.